This topic contains 2 replies, has 2 voices, and was last updated by liyen 10 months, 3 weeks ago. Can we create Multi Series Stacked Column Chart with CanvasJS? 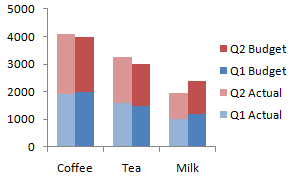 You can achieve Multi-Series Stacked Column Chart(grouped stacked chart) by attaching dataSeries to different axes. Please take a look at this jsfiddle.